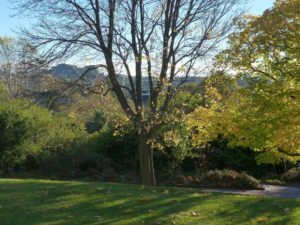 If you’re moving from Oxford to Edinburgh there are some things which you will find very familiar, and others you might find very different. We don’t pretend to give you a comprehensive guide, but we have put together a few points which you might find interesting and/or useful. Both Edinburgh and Oxford are big tourist attractions, so no difference there you might think. However, although Oxford has many festivals itself, these are tiny compared to the Edinburgh Festivals of August, which draw hundreds of thousands of visitors, and at New Year’s Eve, which is called ‘Hogmanay’ in Scotland, and is famously celebrated here. The exact number of visitors to the various festivals is hard to determine. 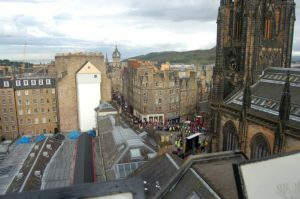 You will be astounded by the crowds on Edinburgh’s famous Royal Mile in August. In general the city is extremely busy in that month and around Hogmanay. 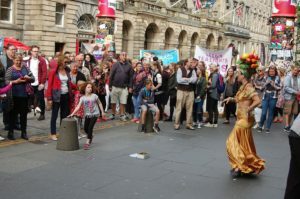 Ever more Edinburgh residents and investors are attempting to profit from this influx, to the extent that the council is now considering restricting Airbnb lets. In recent years the huge number of students has seen an increase in student accommodation facilities. Some of these projects are controversial, such as the large project proposed on Leith Walk which would include a 500-bed student accommodation unit. 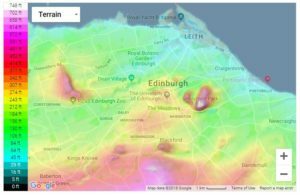 Compared to Oxford, Edinburgh is hilly, as you can see from the map below. Edinburgh runs all the way from sea level to 250.5 m (822 ft), if you include the top of Arthur’s Seat. Arthur’s Seat is the remains of an ancient volcano and the main feature of Holyrood Park, right next to Holyroodhouse Palace and the Scottish Parliament. You’ll have noticed we mentioned the Scottish Parliament. Yes, if you’re moving from Oxford to Edinburgh you’re also moving to a capital city! The Scottish Parliament building itself is controversial. It was designed by a Spanish architect but has several references to Scottish history and architecture embedded in its modern form. We advise you not to judge the book by its cover. Take one of the free tours of its interior before making up your mind! 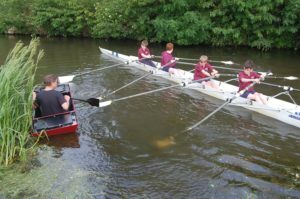 You’ll be familiar with the famous Oxford-Cambridge Boat Race? Rowing is also a popular sport in Edinburgh! Yes, you can receive world-class rowing training at the University of Edinburgh, and the Union Canal (a great place along which to walk or cycle too) is the home of the University’s Meggetland boathouse. The Canal also offers kayaking and canoeing possibilities. Edinburgh has a limited tram service (from the airport to the east end of the city centre) and an excellent bus service. We recommend the Transport for Edinburgh and Lothian Buses websites. Here are a few tips to get those moving from Oxford to Edinburgh off to a good start. Note that we receive no commissions for our recommendations! Akva. One of Edinburgh’s six Swedish bars. This one is situated at the end of the Union Canal and offers good food and a lovely atmosphere. Dominion Cinema. The most luxurious cinema in Edinburgh. A special experience. North Berwick and the Scottish Seabird Centre. A short train journey from Waverley Station, this seaside town adds a new level to the word ‘charming’. There is even a conical hill (North Berwick Law) which offers spectacular views, easy walks and challenging climbs. Portobello. This eastern suburb has a terrific beach, from which one of our employees saw dolphins during the Great Beach Busk of 2018! Royal Botanic Garden Edinburgh. Free entry (but not to the spectacular glasshouses) and a huge range of things to see and do. Great for kids. The central hill offers a wonderful view of the Old Town. Stockbridge. Attractive neighbourhood through which the Water of Leith runs, with several great bars, cafés, restaurants and charity shops. The Shore, Leith. Lovely setting for some great cafés, bars and restaurants. The Shore Bar and Restaurant is also a good music venue. Water of Leith Walkway. Highly recommended. We suggest at least walking from Stockbridge through the stunning Dean Village to the Scottish National Gallery of Modern Art. To conclude, we hope you enjoy your new home city. We’d be happy to help you move there. Why not check out our Oxford to Edinburgh removals page and get a free quote?